We’re tantalizingly close to eradicating polio. Africa has gone an entire year without a new case of wild polio and Nigeria is set to be dropped from the list of polio-endemic countries. Huge challenges still remain, however, and the international community can’t afford to be complacent. This is probably best illustrated with the announcement of a new medical oddity – a man who has been shedding the polio virus for 28 years. To understand the significance of this case, we have to go back to the basics. 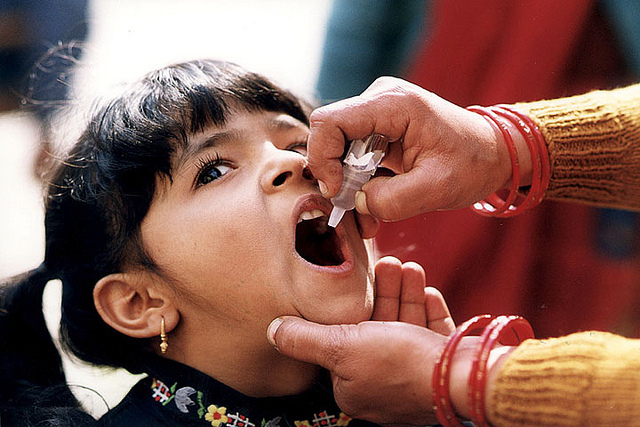 Polio (poliomyelitis) is a highly infectious disease caused by a virus that spreads through unhygienic environments. It can invade the nervous system and paralyze a victim in a matter of hours. There are two main types of the virus: wild poliovirus (WPV), which is naturally occurring, and the circulating vaccine-derived poliovirus (cVDPV). The latter is extremely rare, but can occur when people are given one of the current vaccines available, the oral polio vaccine. The oral vaccine has a weakened, or attenuated, form of the live virus. The vaccine is effective, cheap and easy to administer, which is why it’s used in routine immunizations across developing countries. When a person is given the vaccine, they produce antibodies against the virus and during this time the vaccine-virus is also excreted. While this usually provides passive immunization, in very rare cases the excreted vaccine-virus can continue to circulate for a period of time in under-immunized communities. The longer the vaccine-virus survives, the larger the risk it will mutate to become cVDPV. Researchers have now discovered a man who received a full course of the oral polio vaccine decade ago, but is still excreting the virus. The patient was later diagnosed with an immunodeficiency. After analyzing more than 100 stool samples collected between 1995 and 2015, researchers were surprised with what they found: the patient had been shedding poliovirus for the whole time he was observed, and probably since his last known OPV vaccination – 28 years. The findings were published in PLOS Pathogens. “We have shown that the polio virus can replicate for long periods of time in immunodeficient individuals. In this case, the patient has a genetic deficiency that means he can’t naturally produce antibodies, so the virus cannot be killed,” lead researcher Javier Martin, from the National Institute for Biological Standards and Control, told IFLScience. This case presents a particular problem for current efforts to eradicate polio, Martin explained. While patients have been known to excrete poliovirus for prolonged periods of time, there currently is no effective strategy to deal with them. Martin and his research team had initially thought they were looking at a very different virus, but were surprised to be dealing with a patient who by far represents the longest period of poliovirus excretion. In all similar cases described between 1962 and 2014, only seven involved infections that lasted more than five years. Researchers suggest there is an unknown number of chronic excreters existing elsewhere, with the latest data showing cVDPV strains were present in sewage in Slovakia, Finland, Estonia, and Israel. These patients represent a real risk of polio re-emergence in the post-eradication era, the study suggests. “It’s therefore very important to continue high levels of vaccination and surveillance until eradication is achieved, and even after that. We want to make sure we prevent future polio outbreaks,” Martin told IFLScience.